My child had to pick a Science Fair project. He chose how to get electricity from water. This was a hard project for a 5th grader who struggled with school. He was very excited about the project and was admit that he was going to figure out the project mostly by himself. In school I was never good at Science and had no clue where to start. After asking some wonderful eHow friends who started me off in the correct direction, we were able to do some research about getting electricity from water (hydropower or hydroelectricity). My son decided to build a water wheel. Using the water to turn the water wheel helps to create electricity. Normally the water wheel is connected to a generator. The generator is turned by the water wheel. As the generator turns, energy is store. My son wanted to focus on making the water wheel. We had a large 500 count box of Popsicle sticks he wanted to use. We ended up making three water wheels. The first one my son tried to go against the grain and made his water wheel square. I allowed him make the one square. Although I knew the square would no work as well, he learned from it. We took the square one to the Science fair as well. This way we could tell other people what we learned as well. The second wheel was built with less paddles then the third wheel. This way we can show the difference in the design of the water wheel and show which one worked the best. Decided on the design for the outside part of the water wheel. It is interesting to see the children figure out putting together a circle out of Popsicle stick. In the end it should look like an octagon shape. Glue the stick of the outer wheel together. Place a drop of glue on the end of the stick and place the next stick onto the glue. Continue until the octagon shape is glued together and set to the side to dry. Repeat this step for the second (inner) wheel. Use the Popsicle sticks to make an inner support for the screw to go into. The size of the water wheel will determine the amount of Popsicle sticks needed. Glue the sticks together so the go straight across from one side of the wheel to the opposite side of the wheel. Do not glue to the wheel yet. Place a dot with the pencil in the center of the Popsicle stick. Dot for the hole on the Popsicle stick. Have a parent drill the hole through the Popsicle stick. Do not apply much pressure while drilling. Putting pressure on the Popsicle stick will cause it to split and break. If a Popsicle stick breaks, just repeat step 3 though 5. Repeat step 5 for each support sticks you have. Make sure the sticks holes line up so the screw will be able to go through. Glue the supports to the wheels. All the supports holes should line up together in the middle. Make support to hold the entire water wheel up. 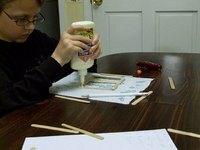 Glue the Popsicle sticks together will the shape of a triangle. You may need to double or triple layer the Popsicle if your water wheel is large. This way the support holder can handle the extra weight. Extra Popsicle sticks on the bottom of the triangle for better support at the bottom. Allow for all the glue to completely dry. We let them sit until the next day. Measure how much room you will have for the paddles. Keep in mind the size of the paddle may be limited by the length of the screw you are using. It would be best to set the support legs, a washer, a wheel, a wheel, a washer, and then the other leg on the screw. Place as much space as you can and measure how much room is left. This should be the size of the paddles. Measure out the paddles on the Popsicle stick and draw a line for each paddle. With the exacto knife or very sharp scissors cut the Popsicle sticks. We used scissors because we didn't have the exacto knife. This may make cracks in some of the sticks, but with an even pressure the paddles will come out. Using an exacto knife would be easier as it will cut evenly without twisting the wood as much as the scissors will. Repeat until you have enough paddles. You can choose how many paddles you would like to have. Put glue marks on the second wheel where the paddle will line up. Set the glue wheel on top of the paddles. The holes need to be lined up on both wheels. You may want to insert the screw to make sure they are lined up. Set the water wheel up on the screw. Place a support leg on the screw. Place a nut on the screw. Tighten the nut up to the support leg. Place a washer next to the nut. Place the wheel onto the screw. Place a washer onto the screw. Place a nut on the screw and move close to the washer, but not tight. You need space for the wheel to be able to move. Place the other support leg on the screw. Place a nut on the screw and tighten to the leg. Test it out. Place the water wheel in a bowl and pour some water over it from the sink or a cup of water. Very important to keep both side of the wheel the same.